It's the sakura season again, probably towards the end of it now. How I wished I can be in Japan now. 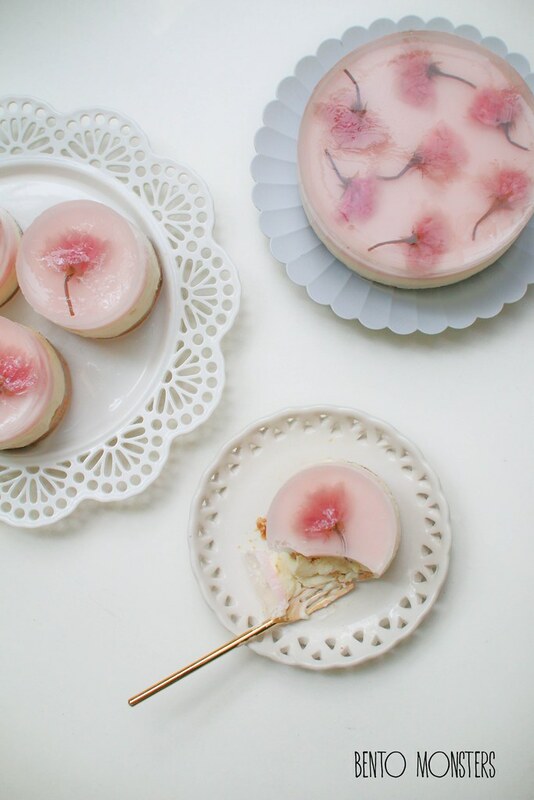 Since I can't go on holiday during this time of the year, I made some sakura desserts instead. 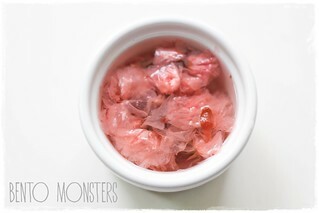 First up is sakura jelly, this is actually quite easy to make, check out my recipe at the end of the post. You will need sakura honey syrup and kanten powder for this. They can both be substituted with honey syrup and agar agar powder respectively, but the taste and texture will be slightly different. Sakura are still so pretty even when dried, the flowers taste like sour plum, since they are pickled. 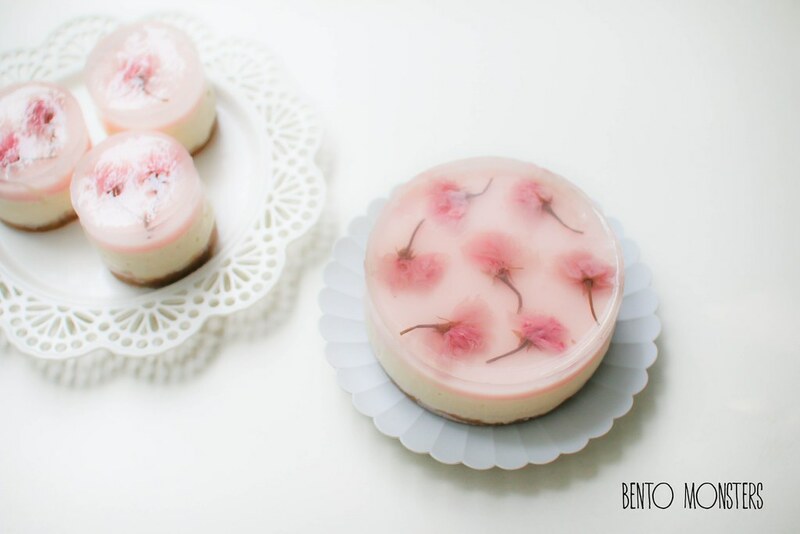 The second dessert I made was Sakura cheese cake. 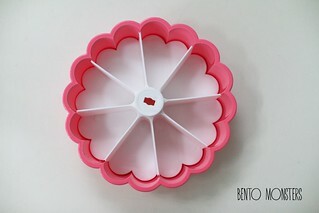 I'm actually missing an ingredient, which I wanted to use to decorate, I thought I had it at home but I could not find it, hiaz. I think I might remake this again next year, if I can remember. The bottom layer is crushed digestive biscuit. The cheese layer is mixed with sakura paste and the top layer is the same as the jelly recipe I'm sharing in this post. 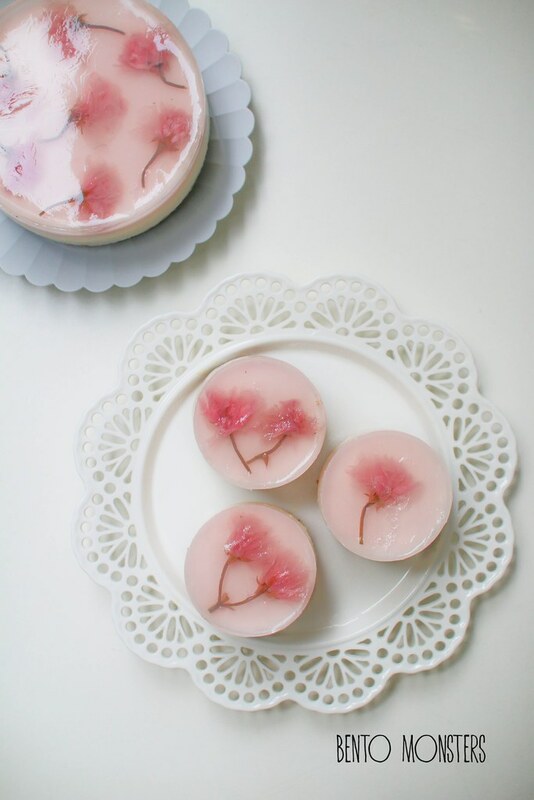 I also made some sakura desserts and shared the recipes previously, you can get the sakura konnyaku jelly recipe here, and sakura macarons recipe here. I found this sakura tricolour mousse in my archive, I think I made it around two years back, shared it on my Instagram, but did not shared on my blog. 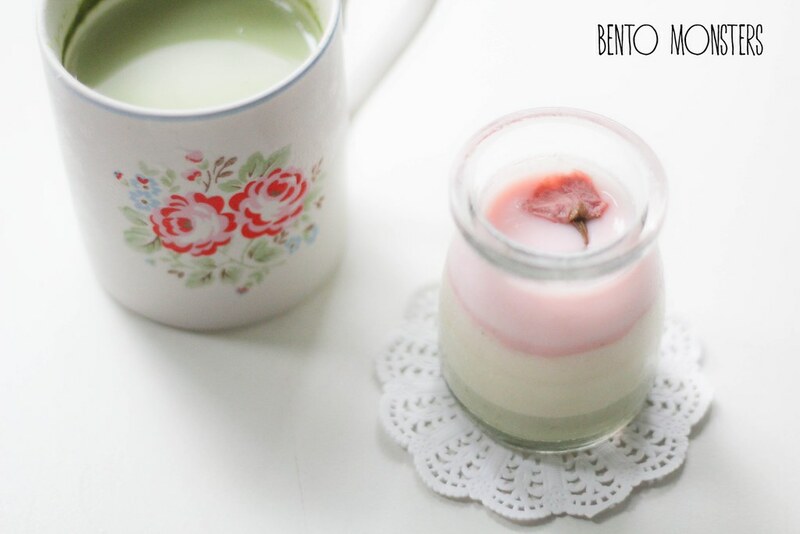 The pink layer is sakura flavoured, white is vanilla and green was green tea. 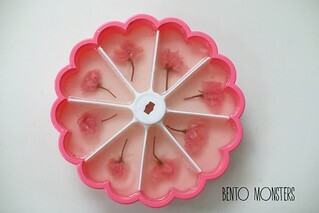 You will need this mould, but you can also use a cake mould. Rinse the pickled sakura to remove excess salt and soak for 30 minutes. Gently pat dry the flowers on paper towels. For the bottom layer, boil all the ingredients except fresh milk, food colouring and sakura honey syrup in a pot at medium heat. Keep stirring the mixture as it heats up. Remove from heat and add fresh milk, food colouring and sakura honey syrup into it, and stir to mix well. Pour mixture into the mould. Leave to cool and place in the fridge to chill for half an hour. For the top layer, boil all the ingredients except honey syrup in a pot and stir to boil at medium heat. Remove from heat and add sakura honey syrup into it and stir to mix well. Pour mixture into the mould. 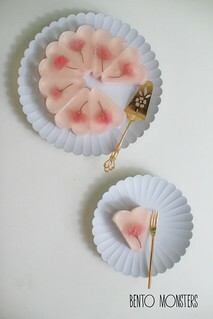 Gently place the sakura blossoms into the mould , gently shake the flowers in the jelly liquids they will open up. You can use a toothpick to adjust the petals. Hi can we replace 2g kanten powder with the agar agar powder instead? Will that work? If so how much grams of agar agar in relative should we replace? Prettiest jelly I've ever seen & I love the colors!!! Love your sakura creations! I know right, can't travel during sakura season cos the kids have to go to school! But these are super pretty! 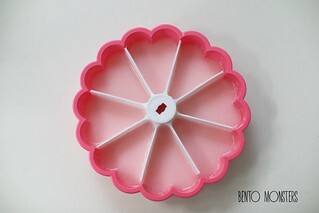 Where would we purchase the mould that you used? Hi can you put the recipe for the tri-colored mousse? I'm sorry, I did it too long ago, I've forgotten which recipe I used, will have to make it again before I can share, will probably be next year as I've used up sakura stuff. Hi, could you share with us the cheesecake recipe? :) Thanks! Hi Stefanie, sorry, I won't be able to update as I did not take down the quantity/measurements. However, I can breakdown the recipe I took from for you. I used this recipe for the base and the cheesecake portion. 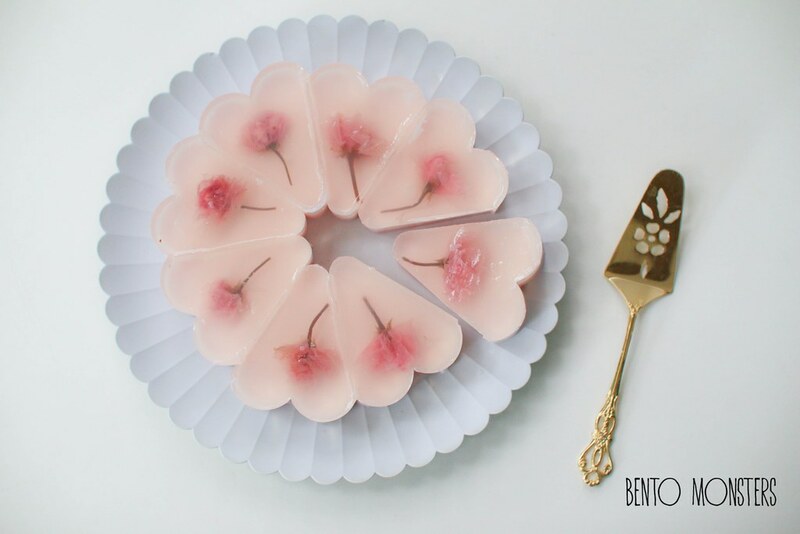 http://www.noobcook.com/strawberry-jelly-cheesecake/ I mix in some sakura paste with the cheese. The top layer is the jelly I shared in this post, I did the same two layers but I reduce the amount as not so much is needed. I'd like to ask for your permission. May I post some of your work on my tumblr blog? (with credits of course) It can also be a way to promote your work. I will not claim any of the pictures as mine! Please response to this. It would mean a lot! !